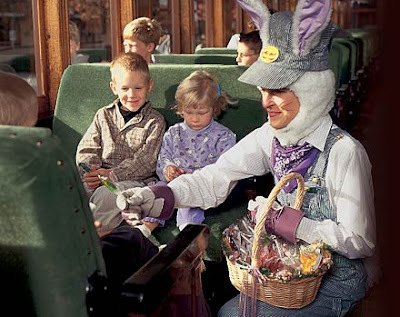 Hop into the season with an Easter tradition at the Strasburg Rail Road. Travel with Peter Cottontail as an authentic steam train takes you on a 45-minute journey from the East Strasburg Station to Paradise, Pa. and back. Also enjoy a ride on our miniature steam train, or steer the Cranky Cars around a track. For a look behind-the-scenes take a tour of the Mechanical Shop where trains are built and refurbished. For a special treat, tempt your taste buds in our Dining Car, our Trackside Restaurant or pack your own lunch for an Easter picnic at Groff’s Grove. Time: 11:00 a.m. – 3:00 p.m. on Friday & Sunday; 11:00 a.m. – 4:00 p.m. and at 6:00 p.m. on Saturday. Where: Strasburg Rail Road, Rt. 741 East, Strasburg, Pa 17579. For advanced tickets, go to www.StrasburgRailRoad.com or call (717) 687-7522.